Among the most important sources of information on a country’s housing stock and characteristics are population and housing censuses. Their usefulness is enhanced when comparable statistics from successive censuses are available, as it is then possible to assess trends on the nature of the housing stock. 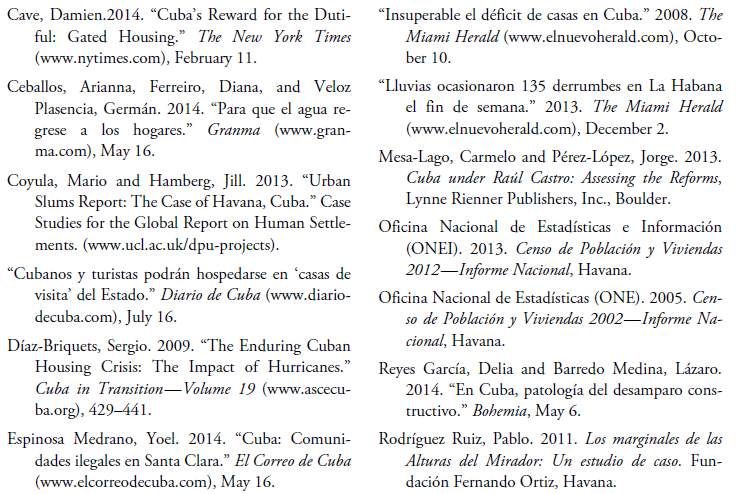 More generally — and in the case of Cuba specifically — these analyses can be further refined by examining census data in conjunction with other information, such as annual statistical series on housing construction, sector-specific academic studies, government policy documents, and qualitative housing-related accounts found in official and independent journalistic sources. The recently-released results from the 2012 Cuban census (Oficina Nacional de Estadística e Información 2013), the latest available, opens these analytical windows as its figures can be contrasted with data from the 2002 census (Oficina Nacional de Estadísticas 2004). For the first time in more than sixty years (the 1943–53 period), conduct and release of 2012 census results aligns Cuba with the international recommend practice that national censuses be conducted every ten years to update statistical information on a periodic basis to support longitudinal analyses of demographic and housing trends. In most respects, housing data from both censuses are comparable, as the majority of housing-related questions included in the 2002 exercise were repeated in 2012. The earlier census included 13 housing-related questions, plus a question on type of occupancy (whether a residency is permanently or temporarily occupied, or unoccupied) and one on the furnishings (e.g., type and number of appliances, as well as vehicles) found within residences. Six of the housing-related questions had sub-questions. The 2012 census, in turn, has 14 housing-related questions, 12 of them comparable (except for minor exceptions) to those from the earlier enumeration. Questions on type of occupancy and furnishings were included, as well as new questions (number 3) on housing ownership (i.e., whether the residence was owned by a resident or by one of several state entities) and disposal of residential waste (question number 12). As in 2002, six of the housing-related questions in the 2012 census had sub-questions. Responses to all questions were not made available in the published 2002 and 2012 census reports. Among the most glaring omissions is the failure to release data on the structural condition (e.g., supporting columns, external or internal supports) or maintenance status (i.e., roofs, floors, walls) of dwelling’s components, although such items were included in both census questionnaires (question 5 in 2002, and question 6 in 2012). Another significant omission is not providing results regarding frequency with which dwellings were supplied with water (e.g., daily, weekly), asked in Questions 9D and 10C in 2002 and 2012, respectively. Likewise, data on type of sanitary facilities (toilets, latrines, etc.) went unpublished (Questions 12 in 2002 and 14 in 2012). These omissions prevent a more thorough analysis and conceal a well-known reality: since the early 1960s, the limited allocation of resources to housing construction, shoddy construction practices, and inadequate maintenance stand behind Cuba’s deteriorating and worsening residential housing stock (for a recent discussion of maintenance issues, see, Reyes García and Barredo Medina 2014). Regardless of these limitations, by comparing housing data from both censuses with other information sources, it is possible to derive some useful, if limited, conclusions pertaining to the evolution of the housing sector during the intercensal period. The overview that follows is limited to national aggregates although the availability of provincial data allows for more detailed examination of conditions in particular areas of the country, including inter-provincial comparisons. The presentation begins with an examination of trends in the overall housing stock by residential unit type and occupancy status. How the housing stock evolved between 2002 and 2012 is shown in Table 1. Of most relevance are the figures for private residences, in effect, those permanently occupied. While the total number of residences increased by 351,573 units (10%) between 2002 and 2012 (column 11, the difference between columns 1 and 6), the number of private residences rose somewhat more to 354,430 (also about 10%). However, the number of permanently occupied residences increased less, by 274,337, or 7.9%. The difference is largely accounted for by spectacular growth in temporarily or seasonally occupied residences, the former increasing by 9,236 units (or 433%), and the latter by 68,196 units (264%).2 Of note are the declining number of units classified as work place (-47.3%) and collective (-26.6%) residences,3 and the 44% drop in officially denoted substandard residential units (listed as solares, bohíos, improvised housing, etc. in the 2012 census, and grouped under “other” in the 2002 census).4 The number of apartments actually declined by about 11,000 units between the two censuses, even though the government has traditionally assigned priority to the fabrication of multifamily structures. Growth in temporarily occupied residences may largely be attributed to a major increase in foreign medical students (from Venezuela, Bolivia, other countries), while declines in work place and collective residences most likely arose from changes in agricultural practices (demise of collective farms?) and, most importantly, by educational policy changes that did away with residential Schools in the Countryside (Escuelas en el Campo). Most surprising is the 146,956 decline in substandard housing, as numerous journalistic sources suggest this type of housing may have been on the increase during the decade in question. 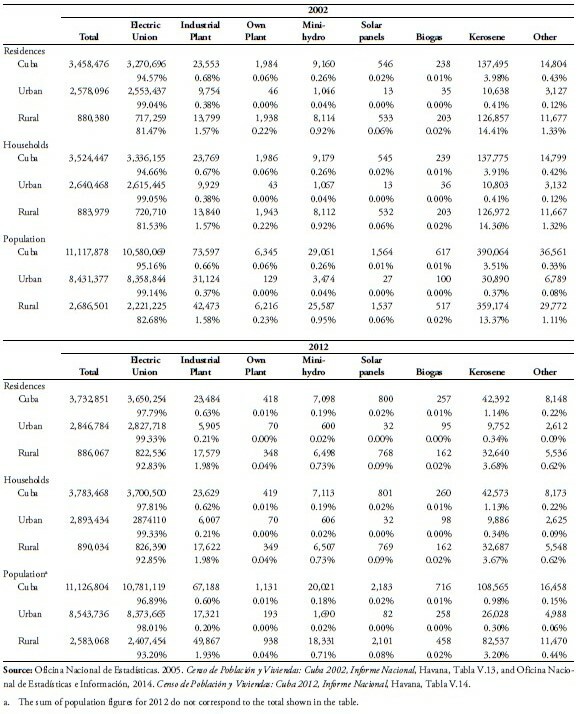 The increase of 275 thousand permanently occupied residences recorded by the censuses is far less (by 37.8%) than the 440,705 housing units officially reported to have been constructed by the state and non-state sectors between 2002 and 2012, as shown in Table 2, with about half of all units built by the non-state sector. Such comparison assumes an equivalency between housing units constructed, as reported in the Anuarios Estadísticos, and census data on permanently occupied private residences. Much of the difference between both sets of figures is likely to have resulted from the housing stock loss occasioned by a succession of destructive hurricanes that crisscrossed Cuba in the late 2000s (Díaz-Briquets 2009). The difference is somewhat minimized as the housing construction figures for 2006 were not downwardly adjusted to reflect what former Vice Minister Carlos Lage denounced as a grossly exaggerated construction estimate that year, inflated by as much as 50% (“Insuperable” 2008). Within the non-state sector, the declining importance of housing construction in agricultural entities is apparent, a trend consistent with census findings. A variable that to some extent may account for differences between the number of enumerated residences and statistics on residential construction, even when considering the declining number of apartments, is the durability of the housing stock. Collapsing buildings are frequently reported — in Havana and other cities — and not only among older pre-revolutionary structures. In one weekend, in November 2013, heavy rains led to the collapse of 135 buildings in the city of Havana alone (“Lluvias” 2013). Collapses have been occasionally noted even among post-1959 pre-fabricated buildings that were often assembled by poorly qualified construction brigades. For purposes of answering the question of how much of the housing stock is lost due to accidental or intentional demolition of buildings, comparing housing data by period of construction in both censuses would be ideal. However, this comparison is fraught with difficulties as the magnitudes of the “unknown” construction date categories in both censuses are significant (17.6% in 2002, and 25.1% in 2012), as shown in Table 3. Interestingly, the percent unknown for the most recent period (1990–2001) is the highest, even though recall should be more favorable regarding more recently constructed structures. The 485,671 census estimate of houses and apartments built between 2002 and 2012 is relatively close to the estimate of 440,705 houses and apartments constructed during a comparable period (Table 2). The former figure also approximates the estimated 432,359 intercensal increase in the number of residences in Table 1. What is perplexing, given what is known about the deteriorating housing situation — and might be explained by considering the data in tables 1 and 3 — is the failure of the statistical authorities to identify a separate category to denote substandard housing, even as the number of permanently occupied residences increased by less than the estimated number of new houses and apartments built. Another contributing factor to this statistical anomaly could be found in increasingly frequent desalojos(forcible removals) the independent press is reporting to be occurring throughout Cuba. The government alleges that dismantling urban shantytowns is necessary if urbanization regulations are to be enforced (see, for example, Espinosa Medrano 2014). Shantytown inhabitants are likely to be migrants to urban areas displaced from former bateyes, as the government’s decision to restructure the sugar industry led to the shutting down of nearly half of the country’s mills around the turn of the century (Mesa-Lago and Pérez-López 2013:18–19). That many shantytowns residents may have departed previously productive sugar regions is suggested by the geographic dispersion of marginal neighborhoods, reportedly found across the length of the island. Since Havana is the epicenter of Cuba’s urban landscape, perhaps it would have been possible to assess why these statistical anomalies occurred by using data from this city. However, this proved unfeasible as data for the capital region were tabulated in the 2002 and 2012 census reports according to different geographical criteria, given the 2011 establishment of two new provinces, Artemisa and Mayabeque, large ly, but not exclusively, carved out of the former Ciudad de la Habana province. With one exception, only relatively modest changes in census household composition patterns by house hold type — including individual, nuclear, extended (a nuclear family plus other related individuals), and compound (a nuclear family plus unrelated individuals) — were recorded over the time span of the two censuses, as shown in Table 4. The most significant change was a 45.1% increase in individual households, compensated by smaller declines in other household types, except for nuclear households solely occupying permanent residences. The former may have been influenced by limited housing avail ability. These changes, partly driven by population growth, also likely responded to unprecedented emigration rates as multi-generational households were able to establish separate residences in housing units that were vacated and became available, a development likely to also have been involved in the growth of single residence nuclear households. This interpretation is suggested by the declining ratios of nuclear house hold to extended household and of nuclear house hold to compound household presented in columns 4 and 8 of Table 4.
occupied private residences, and households and population within them. The treatment focuses solely on the statistic as re ported in the census reports and does not address quality, efficiency or adequacy of service issues. As is well-known and amply documented in numerous sources, such residential services are often highly deficient, insufficient and/or obsolete, and lacking in many instances. As noted earlier, the Cuban census authorities collected adequacy of services data; however, results have not been released. When appropriate, reference will be made to the literature documenting short comings detracting from the quality of residential housing. In 2002, as shown in the second set of columns in Table 5, 5 about 96% of all private occupied residences had access to electricity for lighting and other needs, mostly provided by the national utility (Table 6). In urban areas, coverage was nearly universal. In rural areas only 85% of beneficiaries (to simplify the narrative, henceforth the term “beneficiaries” will collectively refer, unless otherwise noted, to private occupied residences, households, and inhabitants) had access to electricity, with higher percentages accessing the service through smaller generating plants. Most beneficiaries without access to electricity relied on kerosene (14.4% of private occupied residences) to satisfy lighting needs. As electricity access grew, there was a substantial decline in kerosene use — from 14.1% in 2002 to 3.7% in 2012. As a result, the number of Cubans illuminating their homes with sources other than electricity (i.e., kerosene and other) dropped from 388,946 in 2002, to 94,007 in 2012, or by 76%. Of note in Table 6 is the limited increase over time in the utilization of alternative electricity sources: solar panels were available in only .02% of private occupied residences. Over the long haul, greater reliance on solar power, rather than on polluting and inefficient diesel plants, may have proved to be a more economical and lasting solution to improve service in under served rural areas. It is unlikely, however, that large-scale embrace of solar energy (not as developed then as it is today) would have minimized the recurrent urban blackout issue. As expected, most private occupied residences, whether located in urban or rural areas, have cooking facilities (second panel of Table 5). Such facilities are defined by the censuses as separate spaces within a structure whose sole purpose is to prepare meals, store foodstuffs, and store and clean eating utensils. Cooking facilities were found in excess of 96% of occupied residences, the percentages being slightly higher in urban than rural locations, and rising be tween censuses. In 2002, only 290,000 citizens re ported not having access to such facilities, a figure that increased, however, to 317,000 by 2012, even though — in relative terms — the percent of private residences with no separate cooking facility declined from 3.6% to 3.3%. The absolute increase, aside from being associated with population growth, is probably connected with a rise in construction of precarious self-built housing, as indicated. In residences with exclusive spaces for cooking facilities, the vast majority (99% and higher) are for the sole use of an occupied private residence (Table 7). Interestingly, the number of occupied residences with permanent residents reporting the use of common cooking facilities rose between 2002 and 2012, in both rural and urban Cuba, albeit modestly. In urban Cuba, in fact, it doubled from 16,631 to 32,200. These statistics are also suggestive of the proliferation of precarious housing, a phenomenon most in evidence in the country’s cities. In 2002, only about three-quarters of private occupied residences had access to piped water (Table 5), the percentage being twice as high in urban (87.3%) as in rural (44.5%) areas. Population wise, in 2002, close to 2.5 million Cubans were not connected to a piped water distribution system, three-fifths of them residing in rural areas. The 2012 census portrays a relative improvement, connectivity rising to 84%. Reported gains were more substantial in rural areas, with percentages reaching the upper seventies, while in urban areas they were in the low nineties. These percentage gains, in absolute terms, were matched by a decline in the number of Cubans lacking access to piped water from 2,452,572 in 2002, to 1,778,011 in 2012. Access to piped water does not necessarily entail direct household connections, as shown in Table 8. About one quarter of residential housing units with access to piped water in 2002 obtained their supplies through pipes located outside their residences. In rural areas, more than half did so, whereas in urban areas, only about twenty percent did. While the number of residences served by water pipes increased by about 500,000 units between the two censuses, in relative terms those accessing water via direct residential connections declined in both urban and rural areas, but more so in cities (from 81.2% to 75.9%). An additional 635,000 residential units, or about one-quarter of all urban households, relied on outside sources of piped water. In population terms (lower panel of Table 8), about 500,000 more people in urban areas depended on external piped water in 2012 than in 2002. Another perspective on water access for residential use is provided by census data on its availability by type of abode, as shown in Table 9. The overall population served between 2002 and 2012, particularly among house residents, rose, just as availability deteriorated among apartment dwellers, whether reliant on inside or outside pipes. Apartments, not surprisingly, are almost universally served by internal pipe connections drawing water from aqueducts. That was not the case for stand-alone houses, as only about three-quarters obtained their water through internal connections. In 2002, about 2 million Cubans depended on water supplied by wells, rivers and other sources, the number declining to about 1.25 million by 2012. Of note is that between 2002 and 2012, there was an increase of about 250,000 house occupants dependent on well, river and other sources of water, other than pipes. More striking is the rise in the number of apartment dwellers (about 125,000) that came to depend on outside piped water sources between the two censuses. Access to pipe connections, of course, does not trans late into water availability, as can be attested by any observer of the Cuban scene. In Cuba, and not only in Havana, regular water access is a challenge. Ac cording to an official report, 58% of water pumped from aqueducts is lost in transmission, be it because of the rundown condition of master distribution pipes or deteriorated residential connections ( Ceballos et. al. 2014). Some residences with internal pipes only receive water sporadically, if at all, while others are forced to rely on supplies delivered by tank trucks. At certain times of the year, some reservoirs only manage to hold sub-optimal amounts of water resulting in shortages. When taken into account, these limitations provide a far less optimistic outlook regarding water access than suggested by census fig ures. Residential water availability in Cuba is in a state of crisis. 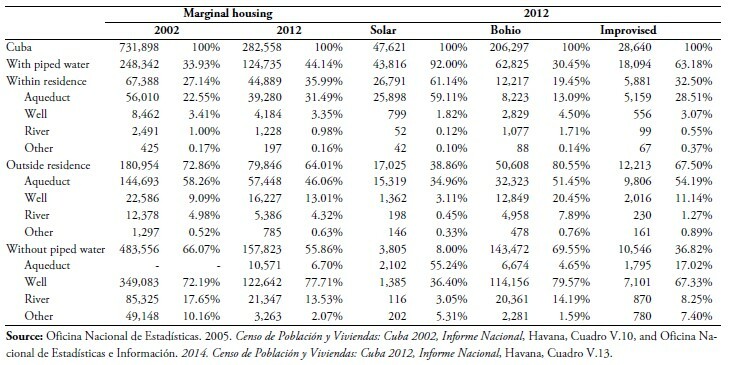 Still another perspective on the availability of water for residential consumption is provided by data in Table 10, showing supply sources in marginal housing (defined as solares, bohíos and improvised housing). The comparative census data (for 2002 the data are only available in the aggregate for the three types of marginal housing) suggests that marginal housing declined by about 450,000 units between 2002 and 2012, a trend inconsistent, as noted earlier, with a growing body of impressionistic evidence. Solares and improvised housing (most likely urban shantytowns) appear most often to be served by urban piped water networks, mostly internal to the former, but external to the latter. This is to be expected given their urban locations and the fact that most solares are found in former residential compounds subdivided for multi-family use. The vast majority of bohíos, traditionally rural housing, relied on well and river water. Nearly four out of every five Cuban residences in 2012 had bathing facilities and/or showers with access to running water, as compared to seven out of ten in 2002, as indicated in the last column of Table 5. The percentages were considerably higher in urban areas; in 2012, more than 86% percent of urban occupied residences had such facilities. In contrast, in rural areas percentages were much lower, with bathing facilities/showers available for only half the population, or some 1.3 million inhabitants. Among residences with access, the percentage with indoor facilities for the country as a whole rose from 87% in 2002 to 92% in 2012. In urban localities, improvements were more modest than in rural areas, as in the latter the intercensal increase exceeded 11 percentage points. Still, by 2012, close to 100,000 rural residences — occupied by nearly 270,000 citizens — did not have indoor bathing facilities or showers with access to running water. In absolute terms, how ever, more people in urban than in rural Cuba lacked indoor bathing facilities, as the most recent census found that more than 350,000 urban citizens only had access to external bathing facilities. To the 600,000 Cubans who only had access to outside bathing facilities, another 3.1 million must be added who lacked any sort of bathing facility (Table 5). In total, about 22% of permanently occupied private residences lacked bathing facilities and/or showers with access to running water. 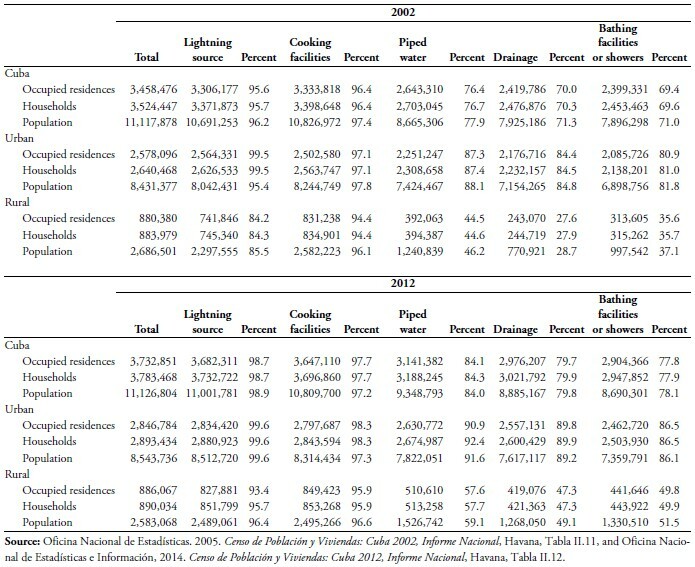 By 2012, close to 80% of all occupied Cuban residences had some sort of drainage system, overall coverage having risen by about 10 percentage points since 2002 (from 70% to 80%, according to the data on the 5 th column of Table 5). The drainage situation was far better in urban areas, coverage nearing 90% by 2012. While rural areas recorded substantial improvements — coverage nearly doubled during the intercensal period — by 2012 less than 50% percent of the rural population, or 1.3 million people, was covered. A closer examination of the sanitation status of the Cuban housing stock, as given by the distribution of available drainage systems (sewer, septic tank, other), can be made by consulting the data in Table 12. Among residences with access to drainage systems, sewer lines have been the dominant form of effluent disposal for Cuba and particularly for urban areas since 2002, some further modest improvements having been achieved by 2012. The opposite is true for rural areas. In 2002, only 3.4% of rural residences were connected to sewer lines, seven times as many homes depending on septic tanks. At that time, close to three-quarters of rural occupied residences did not have access to a sewerage disposal system. The situation had improved by 2012, when rural access to sewer lines and septic tanks had risen appreciably. Still, by 2012, more than 60% of rural occupied residences — home to nearly 1.4 million people — were not served by sanitary waste disposal systems. Even in urban areas in 2012, 10% percent of the population was not served by either sewer lines or septic tanks. Information on residential solid waste disposal (garbage) methods, only available in the 2012 census, is presented in Table 13. In that year, 60% of urban dwellers enjoyed residential solid waste pick-up, with a further 25% stating they disposed of their residential waste in neighborhood containers, and 8% by dumping their waste in open sewers. Residential pick-up only served 21% of rural residences, the vast majority disposing of their solid waste in more primitive fashion: 15% disposed of their residential waste in open dumping places, while 55% burn it, by far the most commonly used residential solid waste disposal method in rural areas. In the country as a whole, residential waste disposal in open dumping places continues to be common, as it is the waste disposal method of choice in about 372 thousand occupied residences. The comparative housing data from the 2002 and 2012 censuses, while confirming some relatively well understood developments, shed light on selected and insufficiently documented characteristics of Cuba’s residential housing stock. The significance of the census data is tempered by their usual limitations and by ONEI’s decision not to release data that could have been used to assess the conditions of the national housing stock. These include data on the maintenance status of private occupied residences, frequency with which residential units receive piped water, or access to selected sanitary services. The variables in question constitute important considerations that must be taken into account when judging the quality and habitability of the national housing stock. That said, several significant conclusions can be drawn from the review of the census housing data. The impact of several hurricanes on the Cuban housing stock was confirmed by the finding that of 441,000 residential units built between 2002 and 2012, 175,000 were unaccounted for in the 2012 census. Also noteworthy is the remarkable growth in seasonally occupied residences, a category likely to be associated with the expanding tourism sector. A most unexpected finding was the absolute and relative decline in number of apartment units, as suggest ed by data in Table 1. Likely contributing factors were the frequent collapse of apartment buildings in Havana and other cities, and the relative shift away from State housing construction (Table 2), as non-state construction is geared to individual residential housing, rather than multifamily structures. Yet, the magnitude of the decline is surprising as the State sector continues to build multifamily units, including many high quality developments designed to reward military families and members of the political elite (Cave 2014). Assignation of limited construction resources to elite residential housing, as well as to economic priority sectors, like the Mariel port development and tourism infrastructure, do not bode well for the perennial housing needs confronting the average citizen. Census data reveal how educational policy shifts have impacted several forms of collective housing. These include the closure of former institutional educational facilities, as the work/study philosophy embodied in the “schools in the countryside” concept was dis carded. Increased registration of foreign students in Cuba has the opposite effect, as the number of temporarily occupied residences has risen sharply. The government can claim success regarding its decision to install a multitude of medium- and small-sized diesel electricity generation plants across the country. This equipment has helped reduce power outages and made electricity nearly universally avail able. Whether or not this decision is justifiable in economic terms — or sustainable in the long-term — is a different matter due to maintenance requirements, environmental impact, and high fuel consumption costs. The most unexpected comparative census finding is that the stock of shantytowns and other precarious residences is presumably on the decline, a trend contrary to other available evidence, including government actions. That the growth of shantytowns is a serious social concern is made evident by the attention authorities are devoting to the topic (e.g., Coyula and Hamberg 2013; Rodríguez Ruiz 2011) and by reports of frequent desalojos. Nor can the declining precarious housing trend suggested by the censuses be accepted at face value when consideration is given to hurricane damage, the government’s inability to replace much of the losses, or the continuing reports of collapsed building, as many displaced residents continue to be housed in inadequate temporary or permanent shelters. There is only one explanation left for this anomaly, namely that the statistical authorities utilize rather lax and incomplete criteria to identify inadequate housing by focusing exclusively on the reporting of “solares, bohíos and improvised housing.” While they do so, they elect not to release other census information pertaining to the quality of the census housing stock. Moreover, available census statistics (on the availability of indoor bathing facilities and showers, access to piped water, etc.) clearly indicate that the adequate housing deficit in Cuba is significant. While grave, it would be even worse were it not for the emigration of tens of thousands of Cubans every year. As they depart, they leave behind homes that — even if in a state of disrepair — often prove qualitatively superior to new occupants, pleased to move away from residences in even worse shape. 1. I am grateful to Mario González-Corzo and Mirian Leiva for valuable observations regarding the contents of this paper. 2. According to the 2012 census, temporarily occupied residences are those that, at the time of the census, housed individuals temporarily in the country, such as foreign technicians and students, diplomatic personnel and their relatives, etc., whereas seasonally occupied residences are those inhabited during certain times of the year, such as beach or country houses (Oficina Nacional de Estadística e Información 2013:103). Seasonally occupied residences may also include so-called casas de visita, residences previously restricted for use by government officials while traveling on official business, or temporarily assigned to them while on vacation. The government just announced that henceforth such residences will be rented to nationals and foreign tourists for leisure purposes (Agendas 2014). 3. Work place residences (in Spanish, local de trabajo) is defined as a residence in a work center that does not constitute a separate housing unit, whereas a collective residence (in Spanish, vivienda colectiva) is a special residential unit, whether temporary or permanent, used by a group of usually unrelated individuals, that while sharing living quarters for the sake of convenience, health, work, education, military discipline, religion or other cause, must follow common rules (Oficina Nacional de Estadística e Información 2013:102). 4. Definitions for 2012 may be found in ibid:103–104 and for 2002 in Oficina Nacional de Estadísticas 2004:91–92 and footnote to Table V.2, but not as detailed. It is reasonable to assume the 2002 definitions across all housing categories correspond to those explicitly defined in the 2012 census. 5. The calculations presented on Table 5 were predicated on the assumption that data not shown as reported indicated that the service in question was not available. In the 2012 census questionnaire, for example, enumerators asked residents if their residences had a separate space for cooking. Interviewees were allowed three possible responses: yes, exclusive to the residence; yes, common to various residences; and no, residence does not have one. Not tabulated responses were assumed to correspond to residences reported as not having separate cooking spaces. Thus, for 2012, it was estimated that 2.3% of all private occupied residences in Cuba in that year did not have cooking spaces. A similar logic was followed for the other four services shown in the table. Corresponding 2012 figures for lighting were 1.3%; for piped water, 15.9%; for drainage, 20.3%; and for bathing facilities and/or showers, 22.8%. 6. This development was undoubtedly facilitated by the availability of Venezuelan subsidies and the continuous flow of low-cost petroleum to Cuba as these plants are highly inefficient and heavy consumers of diesel fuel.